If you had told 16-year-old-Alison, who kept a LiveJournal that was read by approximately 4 people, that she would one day have a blog that total strangers would read, she wouldn't have known what you were talking about, because 16-year-old-Alison didn't know what a "blog" was. It took me until last year to even refer to myself as a blogger, mainly because I didn't know what that meant for me. To be honest, I still don't. I'm figuring it out. But today I thought I'd talk about weird things that I now think about because I blog. I mean, I guess reading blogs is half the point of being a blogger at all, but when I look at my reading list on Feedly or Bloglovin', sometimes I wonder why I started reading certain blogs in the first place, and why I keep reading them. There is one blog in particular that I started reading back before I got engaged, and now that I'm married, I don't really find it all that useful, even though it's not 100% weddings all the time. I feel like the voice has changed. The blog got big. Really big. It feels like a weird mutual admiration society, and I find myself disagreeing with a lot of what the writers post there. So why do I still read it? Honestly, I usually don't. I skip over it in my feed and mark it as "read". Why is it still in my reader? I guess because I'm afraid I'll miss something if I take it out completely. It doesn't bother me to the point that reading it makes me angry or upset, but I certainly don't find it useful anymore. And it's not like the site administrators would know if I suddenly stopped reading. Am I afraid to offend someone? Do I feel like I'm abandoning a blog that provided so much help and support during a specific period of my life? Who knows. 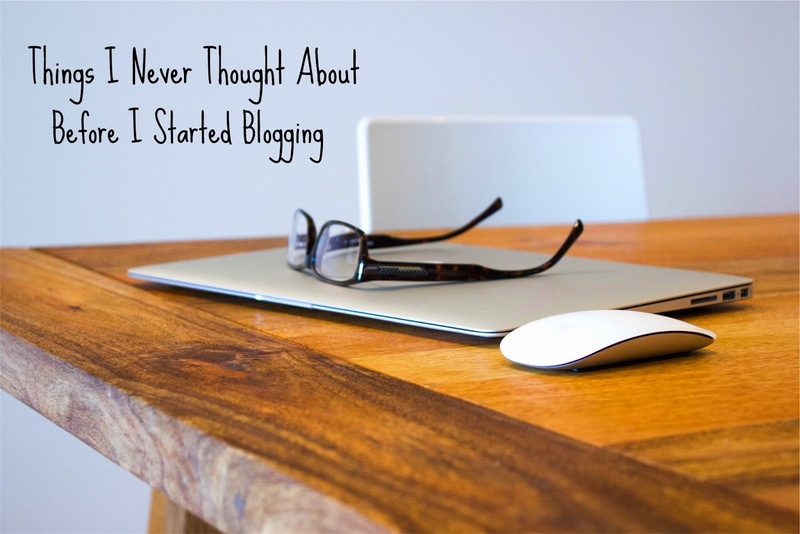 Before I started blogging, I had no idea that people paid bloggers. I also didn't know that you could pay to advertise on other bloggers' sidebars, or have your blog designed by a real human (and not just use the Blogger template). Since then, much has changed. I've advertised my little blog on bigger blogs (like Becoming Adorrable and Kate the Almost Great) and I'm currently in the process of hiring Jenn of Hello Brio to give this space a much-needed makeover! I'm super excited to be working with her, and I love her design aesthetic. And see, I never would have said "design aesthetic" before, and now here I am, using it like I know what it means. Anyway, the fact that bloggers spend money on their sites, and then often make money from them, still kind of blows my mind. When I started writing this blog, I wasn't really sure who it was for or what I was hoping to accomplish. I just kind of treated it like I had treated my LiveJournal, which was a place on the internet to spew my many feelings. It turns out that "spewing feelings" does not equal "useful content," at least not all the time, so I've had to refine what I'm writing here and think about its purpose in the universe. Don't get me wrong, I still spew a lot of feelings. Like, probably too many. But I also try and throw in useful posts, helpful, or funny posts. On a good day, my tiny blog sees only about 100 readers, but I can honestly say that I have never met most of those people in real life. It baffles me that my blog has more than 5 readers, to be honest, so I'm so grateful to all of you who come here and read my words. I also feel like I have become far more censored in what I do post, seeing as my entire med school class probably knows that this exists by now, and I would hate for random people to stumble upon this space and get the wrong idea about me. It's weird to think about what I write as being something for public consumption, versus something for my own personal use and growth. It can definitely be both, and if I didn't want to share it, then I wouldn't put it on the internet for the entire world to see, but it's still weird. There are about 937,000,000 posts about how to be the best blogger/how to start a blog/how to improve your blog, and I think every single one of them has some version of, "Know your brand" on it. I... don't have a brand. Maybe that's because when I started this blog, I was really writing it for me, and therefore, I didn't need to brand myself. Now I am trying to figure that out and narrow down what I want to say and what I want people to learn or feel or get out of my blog, and that's kind of weird. It takes a certain level of narcisscism to be a blogger, I think. You have to think that what you are writing is worth something to someone besides yourself and also think that what you're writing is filling a niche or a need that isn't already filled by the millions of webpages already out there. I have never been one to be overly confident, so getting to a point where I feel like my blog might actually matter has been... rough. Oddly, in the last few weeks, three separate people have told me that I should definitely keep writing, that I have a unique narrative voice, and that even if my story isn't brand new to the internet (which, let's face it, it probably isn't), I'm the only one who can tell my version of it. Now, the hard part is deciding exactly what this blog is for... growing pains are real, people. In today's culture of being able to Instagram every meal, Facebook every mundane task, and tweet our opinions on whatever want, so long as it fits in 140 characters, it shouldn't surprise me that life as a blogger is decidedly different from life as a non-blogger. Now when I do things, I often think about them in a context in which I could write a blog post. When I read things, I think about how I could talk about it on the blog. I have connected with people all over the country through blogging, and I think about the blogging community as a thing unto itself. What started as a hobby and a creative outlet where I could vent is slowly turning into a lifestyle and worldview, and that's definitely weird. There are certainly a lot of days where I still just spew feelings, but even when I do, I try to do it in a way in which my readers (ha, that phrase still kills me), can connect to it. Don't worry, I still leave plenty of my life off of the blog, and I do things all the time that aren't "blog worthy". That's okay, I like it that way. If you blog, what are some of the weird things you've noticed about blogging? If you don't blog, what do you think about blogging? I think about many of these things often. Blogging is a strange life. Yet, even through all the weird blogging thoughts and habits I'm glad I have my little piece of the world. TRUTH. I remember I thought it was so weird when I learned that blogging was a BRAND... say what? I'm still not sure what that means and if I'm okay with it, haha. Me too! I just think it's so weird that people want to read what I have to say. Like, cool but... why! ?